The Newton 403 HydroBond combines mechanical bonding, self-healing capability, easy application, and flexibility in order to provide an external waterproofing barrier for use on any below ground or earth-retained structure. 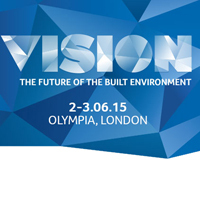 Vision will take place at the Olympia, London on 2-3 June. The product has already been trialled and applied across Europe, with approximately 10,000m2 installed on domestic and commercial sites in 2015. Amongst the installers is Buxted Construction, who fitted 403 HydroBond in 193 Crest Nicholson apartments and executive properties in Sunbury-on-Thames. 403 HydroBond is certified by the BDA Agrément Certificate BAB 14-031/02/A, a high-standard accreditation widely recognised by architects, specifiers and engineers. To provide a durable waterproof covering for the life of the building, HydroBond has been developed to be combined with other Newton products as part of a coordinated waterproofing solution. Newton Senior Technical Manager Richard Crossley will host The Combined Waterproofing Approach in Theatre 4 at Vision London, at 12:30pm on Tuesday 2nd June. The seminar aims to educate attendees on the benefits and strengths of combining HydroBond with other Newton products.